Whilst this roll of honour matches the plaque, there are slight differences between the full roll of honour, which also records those who served, and the final tally of the dead. Many of the men seemed to have served together. Sgt. Harry Worthington 11th Bn. East Lancashire Regt. Pte. Joseph Wolstencroft 1st Bn. East Lancashire Regt. Cpl. Jonathan Ashton 1st Bn. East Lancashire Regt. Pte. John William Thomason 11th Bn. East Lancashire Regt. Pte. Walter Pull 11th Bn. East Lancashire Regt. Pte. Job Haworth 1st Bn. East Lancashire Regt. Pte. Greenwood Holding 11th Bn. East Lancashire Regt. Pte. Walter Grimshaw 11th Bn. East Lancashire Regt. Pte. Edmund Marsland 11th Bn. East Lancashire Regt. Pte. Richard Holden 11th Bn. East Lancashire Regt. Pte. Benjamin Heywood 6th Bn. Lincolnshire Regt. Pte. Joseph Duckworth 6th Bn. East Lancashire Regt. Lieutenant Kingsley D. East was the son of the Rev. James T. East and Mary East, of Hollings House, Cherry Tree, Blackburn. Rev. East was the minister at Clayton-le-Moors during the war. Kingsley East is recorded by the Commonwealth Graves Commission as having been a Tutor at Cliff College, Sheffield (although not that he or his father were Wesleyans), and his obituary in the Minutes of the 1918 Wesleyan Methodist Conference reveals that he had entered Didsbury College as a candidate for the ministry before enlisting. Walter Grimshaw died towards the end of the war. The Roll of Honour in the church does not mark him as dead. These two men are recorded as having died on the Roll of Honour displayed in the church. Tom Clough died in Greece towards the end of the war. The name of Frank Heywood was clearly added after the full roll of honour was printed. 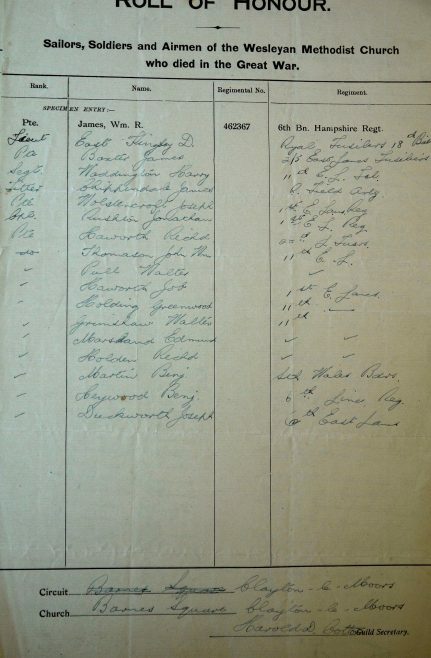 Unfortunately the records of the Commonwealth War Graves Commission do not allow any of a number of men of this name to be connected with Clayton-le-Moors. Additional source: Commonwealth War Graves Commission.